The Oyo/Osun Command of the Nigeria Customs on Thursday said it has intercepted Tipper loaded with smuggled imported frozen poultry products after three days of ambush along the Agunrege/Saki axis, in Atisbo Local Government area of Oyo state. The seized frozen poultry products packed in 1600 cartons were buried and destroyed by the officers. At the site of the destruction were Customs and police officials, newsmen, members of the public and officials of National Agency for Food and Drug Administration and Control (NAFDAC). The poultry products which was worth N12.8million, according to the Command was made possible through intelligence gathering. Speaking at the destruction of the banned poultry products at the Arapaja Dump site at Oluyole Local Government of the state, the Customs Area Comptroller of the Command, Mr Temitope Ogunkua said customs officers would not relent in their effort to stop smuggling of banned products. 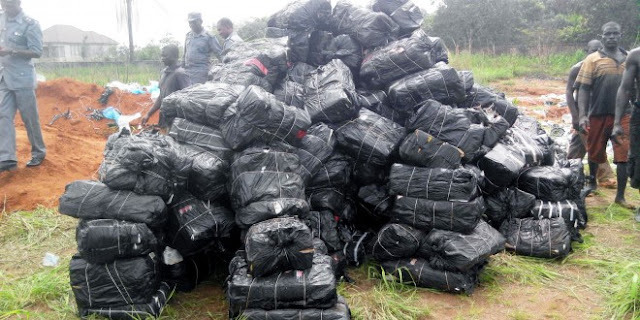 “We will continue to chase them and we will reduce smuggling in the Command. What you have seen is one of the antics of smugglers. If you see that vehicle you will think its carrying gravel but from the intelligence we gathered we discovered it was loaded with imported frozen poultry products. Apart from the fact that poultry product is prohibited what about the health hazard to people who consume these products. I use this opportunity again to appeal to Nigerians that they should stop smuggling and we should be wary of the things they buy “, he said. Also showcased before newsmen were two fairly used DAF truck with registration numbers AGL 709 XR and LSD 774 XF which were arrested by officers of the Command at different border locations within the state. The trucks were loaded with smuggled imported 900 bags of 50kg of rice . The Controller who warned members of the public against consuming imported frozen poultry because of its various health hazards revealed that the Command has devised strategies to beat all methods of concealment used by smugglers. ” The Command wishes to use this medium to reiterate that our resolve to remain resilient and dogged still stands as we continue to re-engineer our operational architecture in the realisation and actualiation of the service core mandate of revenue generation and suppression of smuggling”, Ogunkua said.